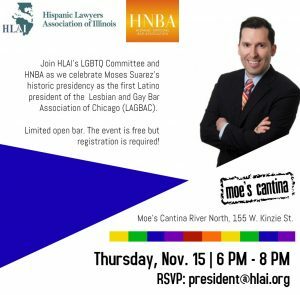 Join HLAI’s LGBT Committee and HNBA as we celebrate Moses Suarez’s historic presidency as the first Latino president of the Lesbian and Gay Bar Association of Chicago (LAGBAC). This is a free event with a limited open bar and RSVP is required. Please RSVP to president@hlai.org.